Why Don't a Yorkie's Ears Stand Up? Yorkshire terriers are characterized by a set of small ''V''-shaped ears that are carried erect and not set too far apart, according to the American Kennel Club's breed's standard. If you own a puppy with floppy ears, there may still be hope for erect ears depending on the puppy's age and the characteristics of its ears. Yorkshire terriers are all born with floppy ears. They will remain so until they have developed the necessary muscle strength at the base of the ear in order to allow them to stand up, according to Yorkie Info Center. The ears of a Yorkshire terrier should gradually begin to stand up between the age of 3 to 6 months. At times, one ear may stand up before the other. Some Yorkshire terrier puppies may take longer than others for their ears to become erect. 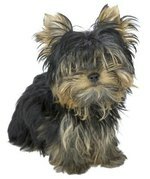 However, Yorkies with large, tough textured ears may be destined to have floppy ears. There are ways to help a Yorkshire build muscle to allow the ears to stand. This involves massaging the base of the dog's ears, shaving the ears to reduce weight and taping the ears. If despite your intervention the ears will not stand up by the age of 7 months, you should be ready to accept owning a floppy-eared Yorkie. It may never make it to the show ring, but will still make a lovable pet.